The new Disney film "Tangled" is a retelling of the story of Rapunzel, complete with 3-D action. (CNN) -- Disney goes back to its roots with "Tangled," an animated fairy story in the tradition of "Snow White" and "Sleeping Beauty," but not without adding a few new digital, 3-D kinks. The tale of Rapunzel goes back 400 years or more. Snatched from her rightful parents as a baby by an evil crone, Rapunzel is locked in a tower in the middle of the woods, visited only by the witch. In the most memorable detail, the girl's long tresses serve as the crone's ladder: "Rapunzel, Rapunzel, let down your hair!" In Disney's telling, Rapunzel is desperate to do just that, though she's now a princess stolen by the old woman for her hair's magical rejuvenating powers: Botox, without the needle. 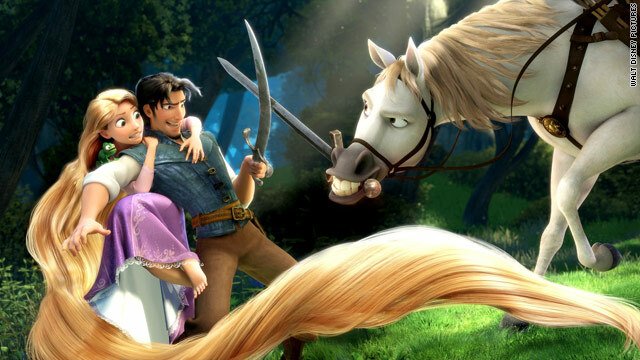 The new title, "Tangled," is an attempt to lure boys and men into the theater, we're told. Instead of the bland handsome prince of the story -- always a ho-hum character in fairy tales -- screenwriter Dan Fogelman ("Cars," "Bolt") has come up with a reckless rapscallion, Flynn Rider, a merry thief who snatches the missing princess' tiara and inadvertently returns it to its true owner as he flees the palace guards. Flynn (his name is clearly inspired by Errol) does bring a dash of energy and action to the film, whether it's bounding over the castle rooftops or engaging in a slapstick duel with his most dedicated pursuer, one of the king's horses. But Rapunzel proves more than a match for this handsome intruder. She may look like a Barbie doll, but Rapunzel is another addition to the more recent Disney tradition of emancipated heroines, a sister to the Little Mermaid and Mulan. A dab hand with a frying pan, and twirling her hair like a lariat, she soon makes Flynn her prisoner and insists he help her get away from her ivory tower. This snappy role reversal may or may not appeal to young men -- getting repeatedly clunked on the head with a kitchen utensil isn't every boy's fantasy -- but it inspires some classic knockabout screwball comedy and an exciting, vertiginous escape sequence. Voicing Rapunzel, Mandy Moore sings Alan Menken's yearning ballads very sweetly, and goes some way to banish the bad memories of "License to Wed." But the stand-out performance is Tony-winner Donna Murphy as the passive-aggressive crone, Mother Gothel, who seizes Menken's grand, theatrical number "Mother Knows Best" for the showstopper it deserves to be. As evil stepmothers go, Gothel is a relatively subtle villain, an overprotective mom who wants to preserve her daughter's purity to hold on to her own lost youth. What could be wrong with that? There's a head-scratchingly devious bit of plotting when Gothel has Rapunzel in her clutches and decides to let her go. (Since when did witches get so psychological?) But this paves the way for the film's most lyrical romantic sequence, when Rapunzel and Flynn watch hundreds of lanterns float through the air so close that you want to reach out and touch them. It's the single most effective use of 3-D since "Avatar," a pretty ribbon tied to a pleasingly spry gloss on a very old story.